“All Episcopalians in Hawai`i shall work together to create a Church filled with visible and spirit-driven Christians and Christians who are eager to share our Episcopal tradition and faith, and traditional Hawaiian spiritual values, with those who have not yet found a spiritual anchor in their lives.” Vision of the Diocese of Hawaii. The Pacific Islander Ministries takes up the great lessons of church work of the past; reach out to those most in need, which often, especially in Hawaii, translates into the newest immigrant group. In this way, as shown below, we proclaim the Good News of the Kingdom. Pacific Islander Ministries proclaims that good news by going out to people from Micronesia, Tonga, Tahiti and New Zealand/Aotearoa not only at St. Elizabeth's, but also at St. Nicholas'; St. Mary's and St. Peter's. This going out has brought in Chuukese women who sang at convention and at the Cathedral's June 22 fundraiser. It has brought in Chuukese men who pass on indigenous traditions of farming and woodcrafting to the younger generation, and it is bringing in Marshallese to St. Nicholas. St. Nicholas is actively involved with Micronesians in the homeless shelter in Kapolei and because so many immigrants transfer from Palama (downtown) out to Kapolei and Wahiawa, the opportunities for linking our parishes and members is significant. Furthermore, St. Nicholas has a thriving reading program targeted at immigrant children, with an average attendance of some 25 children! All of these efforts respond to human need through loving service. St Mary's has opened its doors to Micronesian immigrants who have joined in parish workdays, a Christmas program and who help defray costs at St. Mary’s by renting its chapel for services. Viliami Lino will continue his dad’s efforts that brought 60 youth to learn ukulele in Moilili every Friday night. St. Peter's has for several years maintained a weekly fried rice and prayer breakfast for Central Intermediate school children. Fane Lino attends these regularly. The religious background of our new immigrants is typical of those in Polynesia: Roman Catholic or a generic Protestant. Both groups have found a home in the Episcopal Church because of our Via Media or Middle Way, taking the best from the Roman Catholic and Protestant traditions. In this new home, we teach and baptize and nurture new believers. (St. Elizabeth’s alone has recently received and/or baptized 16 Chuukese members, and over 30 Chuukese regularly attend its Sunday service). This work is also occurring on the outer islands. Since the first of December, 2011, Christ Church, Kealakekua has hosted an enthusiastic community of believers from the Marshall Islands. What began as a tentative request for space use ("we're having an island-wide service and we need a place to gather") has become a long-term relationship that includes the Christ Church Episcopal congregation and the Kona Full Gospel congregation. What began as a simple space-sharing arrangement, with the Marshallese folks has grown when they began to explore monthly worship/Sunday brunch and occasionally shared a song or two with each other. After more conversation, Christ Church has exchanged gathering space and in return the Marshallese congregation is providing janitorial services. So far, all appear to be happy with the arrangement. The Marshallese folks are gracious guests. Despite (or maybe because of) some very obvious linguistic, cultural, and liturgical differences, we are connected by our faith in and love of Christ. The members of Christ Church need look only as far as the next table on the first Sunday of the month to see opportunities for outreach, as many of our Marshallese friends are struggling to make ends meet in a challenging economy. The Episcopal Church was, for a time in Hawaii, one that intentionally reached out to various immigrant groups, (and that is reflected in a number of our still ethnic parishes and missions) but since the 1950s has perhaps become insular and our small numbers reflect that insularity. The Pacific Islander Ministries is a resurgence of past efforts to reach outside of the traditional Episcopal comfort zone to those who are strangers, hungry and in need of shelter. 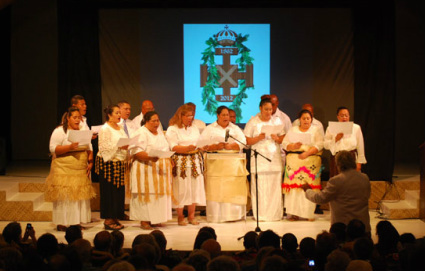 Accordingly, Pacific Islander Ministries is a ministry that involves on a constant basis several parishes working together, fostering the Hawaiian values of Pono, Malama and Mana and is targeted at those seeking a home for worship. The presence of the Lino family, (even in the absence of Fr. Simone who died suddenly on January 8, 2012), not only impacts very favorably the Pacific Islander Ministries, but that family has brought into the Episcopal Church many Tongan nationals and is making outreach efforts to Fijians and New Zealanders in Hawaii. The Linos, as the spearhead of Pacific Island Ministries, are empowering Pacific Islanders to develop their own leaders, congregations and vibrant faith communities in their own mother tongues. It is understood that ministry of this nature is rooted in relationships. Relationships take time to form. We therefore pray that the diocese continue to fund (at least at current levels) the ministry of Pacific Islander Ministries and the ministry of the Lino family so that the already significant growth we have seen to date may continue. The benefits of this ministry reach far beyond the immigrant community and directly into the wider, more established community. For example, St. Elizabeth's has experienced a growth not only among the immigrant community, but also among the established kamaaina community (including those quite well-off financially) because they are attracted to a ministry that is actively and demonstrably living out the gospel call. The story is as old as the first commission. When we go out, God brings people in. Pacific Islander Ministries, carried out through the Lino family and others, is doing just that.